Some people call two days off a weekend, but in this business two days is damn near a sabbatical. When I'm on vacation, I like to cook and eat. 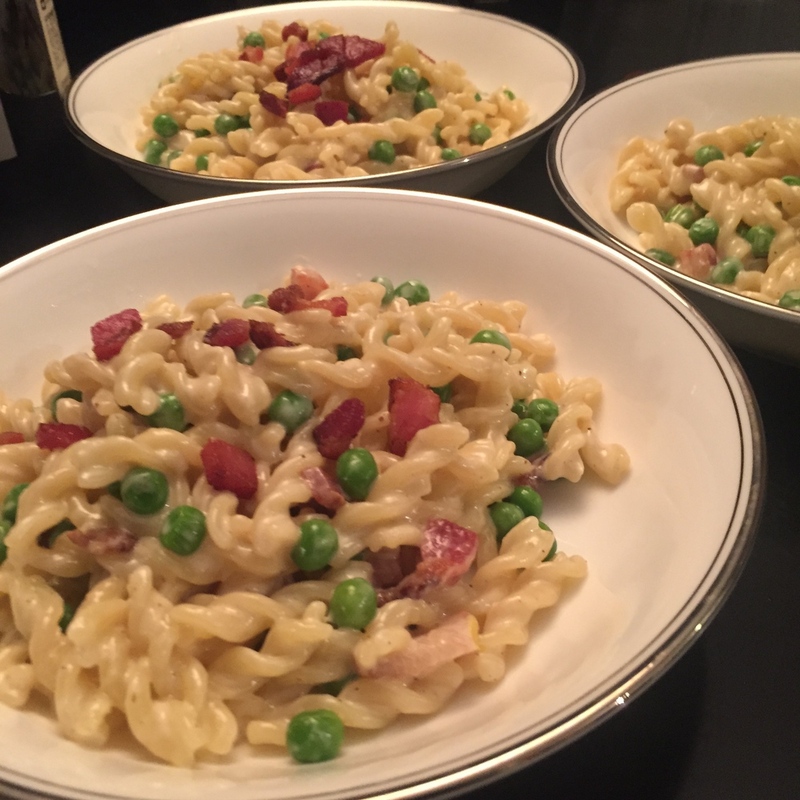 So my wife Rachel and I invited my sister-in-law Jenny over for dinner and we cooked up some smoky, "almost spring" pasta. Dinner with Rachel and Jenny usually involves dancing, squealing, wine, and cursing - it's pretty much my favorite thing to do. Like all great pastas, buy the best ingredients and don't add too much. 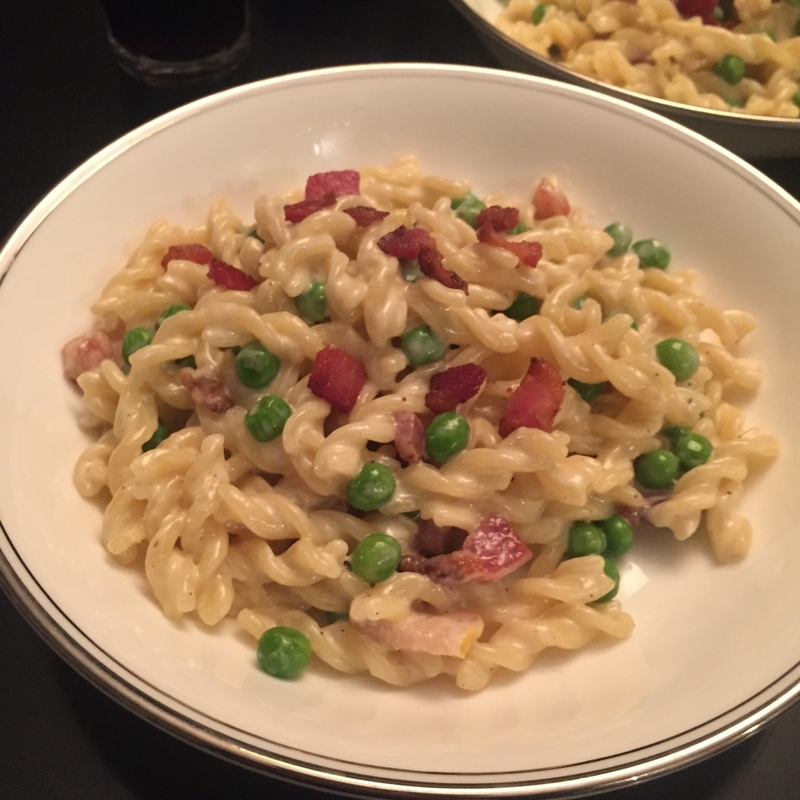 At it's core, this dish is bacon, bacon fat, cream, peas, and pasta. You can veer a bit from there if you wish. In this case, I wanted bright and hopeful and for me, that's lemon and tons of black pepper. Tip for Chicago life: when in need of spring eat lemon and black pepper. Bring a large pot of water to a boil for the pasta. While the pasta water is heating up, preheat a large sauce pan over medium heat. When hot, add the olive oil and the diced bacon. Render the bacon until crisp and remove the bacon with a slotted spoon and let drain on paper towel. Pour off all of the remaining fat from the pan except for about 2 tablespoons (reserve the extra bacon fat for your eggs tomorrow). Return the sauce pan to medium heat and add the shallots and sweat for about 2 minutes, until just softened. Then add the garlic and stir until you can really smell the garlicky aroma, about 1 minute. Carefully add the wine and scrape the bottom of the pan to incorporate the bacon fond (caramelized bacon bits stuck to the pan) into the sauce. Simmer the wine for about 1 minute. Then add the cream and bring the whole mixture to a gentle simmer. Your pasta water should be boiling. Add salt to the water (it should taste almost like the sea). Add the fusilli to the boiling, salted water and stir. While the pasta is cooking, add the frozen peas to a fine mesh strainer and dip into the boiling pasta water to defrost. This should take about 1 minute. Lift the strainer from the pasta water and drain well. 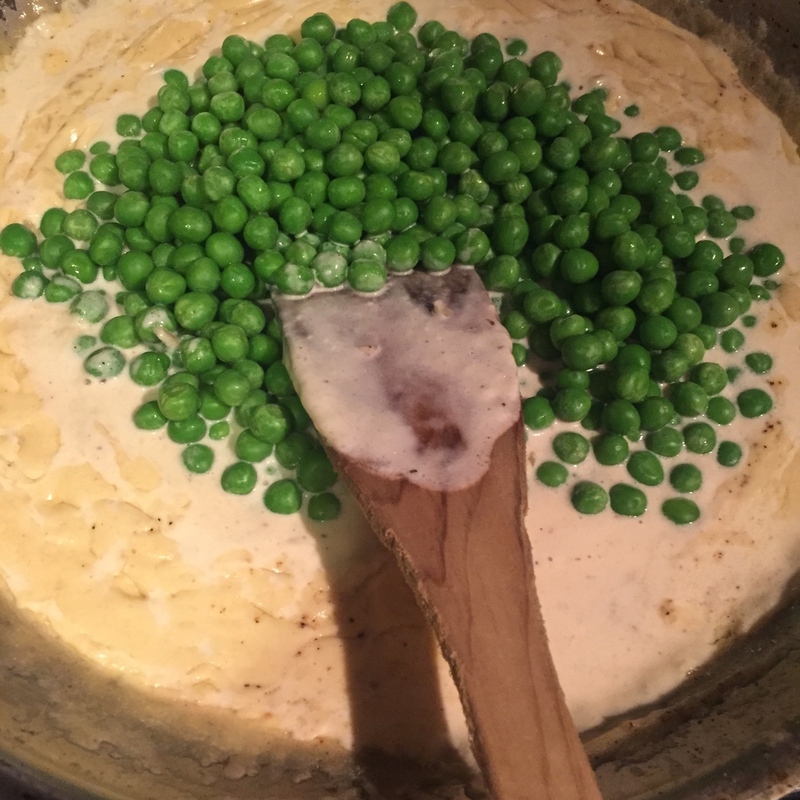 Then add the peas to the simmering cream sauce and stir in. Cook the pasta until al dente, about 10 minutes. Reserve a cup or so of the pasta cooking water and then drain the pasta, pouring off all the water. Return the empty pasta cooking pot to the stove over medium heat and add the drained hot pasta to the pot. Then pour the cream sauce mixture over the pasta. If necessary, add some of the reserved pasta cooking liquid to thin the sauce. Stir the pasta over medium heat for a minute or two to combine. Reduce the heat to low and add the cheese and mix well. Then add the zest and juice of one lemon to the pasta and stir in. Then add half the rendered bacon and plenty of fresh cracked black pepper. Taste the pasta for seasoning and if necessary add a little salt. Again, adjust the sauce with some pasta cooking liquid if the sauce has become too thick. the sauce should coat the pasta but it should not be stiff. Plate the pasta in bowls and top with the remains crispy bacon and drink with wine and the Brown sisters.